Georgia District 54 State Senator Chuck Payne, seated right, and Democratic challenger Michael Morgan, seated left, participate in a forum hosted by the League of Women Voters of Dalton Inc. at the Mack Gaston Community Center on Thursday, Oct. 18, 2018 in Dalton, Ga.
DALTON, Ga. — Both the Democratic and Republican candidates in a North Georgia State Senate race said Thursday night they support HOPE scholarships for Dreamers. During a forum hosted by the League of Women Voters of the Dalton Area, incumbent state Sen. Chuck Payne told the audience he has raised his family on the south end of Whitfield County, where many Latino residents live. He said he coached the children in sports. He calls his neighbor a "redneck Latino." "I know young men and women who have grown up here in Whitfield County," he said. "I don't know their parents' legal status. But they are Georgians. And these kids, they're as Georgian as anybody else and as Georgian as my kids." Payne, R-Dalton, said Congress needs to pass a long-term solution for Dreamers, immigrants who came to the United States illegally but have received temporary protection through Deferred Action for Childhood Arrivals, an initiative under President Barack Obama. Pressed further during Thursday's forum about whether these students should receive the HOPE scholarship, Payne did not make a commitment either way. But when asked by the Times Free Press after the event, Payne said, "If it were up to me, I'd be for it." His opponent, Democrat Michael Morgan, said during the forum that he supported using the scholarship for Dreamers. "This is your home," he said. "I think we ought to give you a path to citizenship, and I think we ought to educate you. They're coming through our school systems, and they're good students." Payne's answer on the issue bucks his party's orthodoxy this year, as the debate over the use of the HOPE scholarship for Dreamers has become a major issue between the state's candidates for governor. After Democrat Stacey Abrams said Dreamers should qualify for the HOPE scholarship during a visit to Dalton in July, Republican Brian Kemp attacked her in an ad, telling the viewer, "She says it's their right; I say it's just wrong." But unlike other portions of rural northwest Georgia, Whitfield County has a significant Latino population. About 70 percent of Dalton Public Schools' students are Latino. Dalton State, meanwhile, became a Hispanic Serving Institution earlier this year, opening the college up to more federal grants. Payne and Morgan will face each other for the District 54 seat in the Nov. 6 election. Voting has already begun. District 54 covers Murray, Whitfield, northeastern Gordon and western Pickens counties. 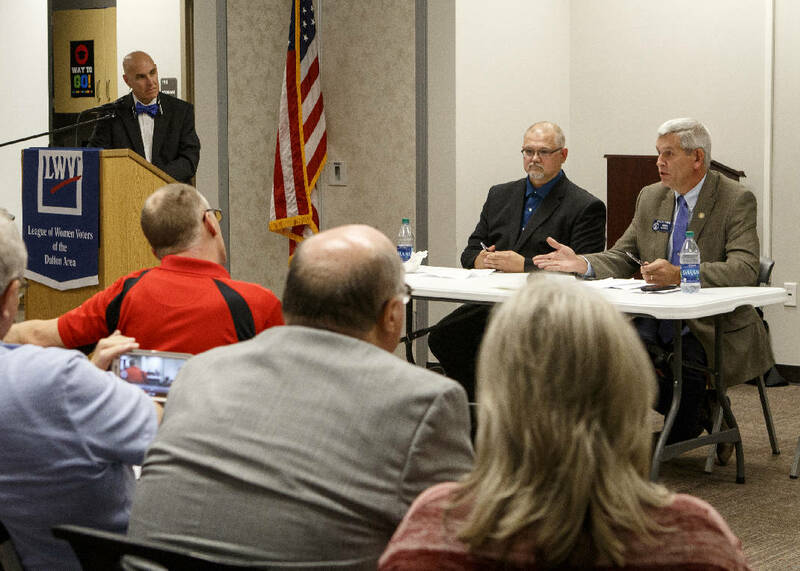 In addition to the discussion on the HOPE scholarship, the candidates debated Medicaid expansion, religious freedom bills and a guaranteed quality of pay between men and women. They disagreed on these topics. Concerning Medicaid expansion, Payne said the measure would cost too much money. But Morgan, a lab manager at Wacker, said increasing the number of people with health insurance in the state should, in the long run, save money for hospitals and people already insured. "The federal government can't keep funding stuff, over and over and over again," Morgan said. "But they just gave a tax cut, predominantly to the top 1 percent of this country. Nobody said anything about money that added to the deficit. We need to stop taking care of the top 1 percent so much as taking care of the people that are out here busting their rear ends and working every day." Morgan said the state legislature should not pass a religious freedom law, arguing it will actually amount to discrimination by some business owners. Payne said this type of law will not create any problems, so long as it is a copy of the federal law signed by President Bill Clinton in 1993. On equal pay between men and women, Morgan said he didn't understand how the issue became controversial. "Women should have equal rights as men," he said. "They should be paid equal. They should be treated as human beings. That's what it boils down to. Anytime you treat — in business or in life — a gender, a race, a sexual orientation as lesser, then you're devaluing that person." Payne said he doesn't think such a law is necessary. He believes equal pay statistics are skewed because some women leave the workforce to raise families. He added that his wife made twice as much as he did when he worked for the Georgia Department of Juvenile Justice, and she is also against an equal pay law. "Someone who's going in and out of the workforce, and someone who's been in the workforce for 20 years, they're going to make different amounts," Payne said. "To say that's not a factor is, I think, naive." During his primary this year, Payne was challenged to the right after he rejected a bill that would give a special driver's license to immigrants who hold work permits but no lawful status. The licenses would be oriented vertically instead of horizontally, with the messages "NO LAWFUL STATUS" and "NOT ACCEPTABLE FOR OFFICIAL PURPOSES." They would expire when the holder's work permit expires. Payne said the new IDs would cost the state too much money. His opponent in the Republican primary, Scott Tidwell, said Payne was too weak on immigration, which Tidwell argued was the country's most important issue. Payne defeated Tidwell in the primary, with 52 percent of the vote.